The U.S. Geological Survey is currently assessing the oil and natural gas resources of the U.S. Gulf of Mexico region using a total petroleum system approach. An essential part of this geologically based method is evaluating the effectiveness of potential source rocks in the petroleum system. 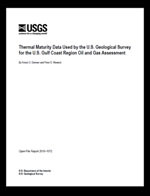 The purpose of this report is to make available to the public RockEval and vitrinite reflectance data from more than 1,900 samples of Mesozoic and Tertiary rock core and coal samples in the Gulf of Mexico area in a format that facilitates inclusion into a geographic information system. These data provide parameters by which the thermal maturity, type, and richness of potential sources of oil and gas in this region can be evaluated.